Which of these QI wireless charging pads is worthy of your money? Wireless charging pads are now a mainstream product, with almost all major smartphone makers incorporating wireless charging into their new handsets. That has inevitably led to a massive boom in the amount of Qi wireless charging pads hitting the market. Not all wireless charging pads are built equal, though. 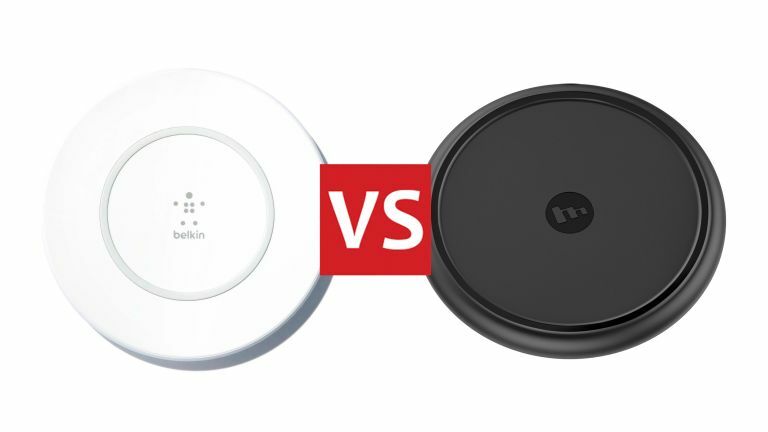 Here we've pitted two leading wireless charger makers, Mophie and Belkin, against each other, with their identically priced pads clashing head-to-head on a number of important performance criteria. Design: Mophie’s charger is mostly rubber-coated, so it’s grippy on a tabletop. It has a smaller diameter than the Belkin, so larger phones overhang. In practice, you’ll want to leave room to avoid knocks to your phone whichever mat you choose. Power Adapter: Mophie’s base has a rounded outer edge. The cable slots into a recessed port and has a flush finish at the mat’s edge. Unlike the Belkin, the cable runs into the plug’s bottom. The light on the base’s front is arguably more discreet, but a little harder to see. Value: Beyond their outward appearance, the two mats are very similar, with an identical price tag, so it all hinges on if you want to pay for convenience. However, this mat’s size is a little conservative for phones with a screen over 5.5 inches. Charging: The Qi standard is 5W of charging power, but both these pads provide 7.5W for iPhone 8/X only. Anything Qi-compatible will work with both pads at the lower range. An iPhone X goes from 0 to 100% in three and a half hours from this pad. We're impressed with the smaller size, which is great on desk, as too the faster charging for iPhones. We'd improve 7.5W max charging speed, which isn't that fast, and also how the cable runs into the bottom of the plug, which is fiddly. Design: Glance at the Boost Up, and you might mistake it for a saucer. Its body is slightly wider at the top than the bottom, with a grippy rubber ring on top for your phone, and the same material on the bottom to stop slippage. It’s great for larger phones. Power Adapter: Under the pad’s rim is a small cavity for connecting the mains cable. Connecting to the top of the plug means you won’t have trouble with a low wall socket. A pinhole-sized light on top, near the rim, illuminates only when power is being transferred. Value: The convenience of inductive charging carries a premium: most phones have a quick-charge option they either come with an adapter for, or you can buy for about £20 that will charge them faster. It’s much less cool, admittedly. Charging: This took the same amount of time to charge an iPhone X as the Mophie, but again, worked fine. As a sign of how wireless power works, they’re only a tiny bit faster than using the wired 5W iPhone adapter, not the 50% faster you might expect. We're impressed with how this charger handles larger phones, as well as its top-located plug insert and super-fast iPhone charging. We'd improve the price, which is quite steep, as well as the general charging speed for other smartphone makes.